For the third year in a row, AVNation is heading to Las Vegas to bring you the latest in the digital signage market. Follow along March 26 – 29 as we bring you the latest in content creation, content management, display, and mounting technology, and unique ways to sell digital signage systems. Our coverage of Digital Signage Expo 2019 is made possible by our great group of supporters. To find out more about supporting AVNation TV click here. 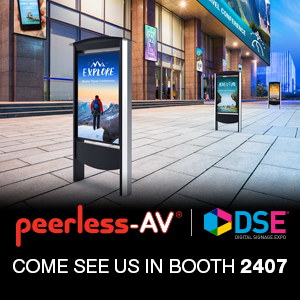 Talking with Zuzor about using digital signage and interactive displays to create unique experiences at DSE 2019. Discussing with Advantech about deploying digital signage with integrators at DSE 2019. Seeing Optoma’s new line of Direct View LED indoor displays at DSE 2019. Talking to Epson about using projection mapping in the digital signage space to create new and unique experiences. The Women of DS invite commercial integrators and creatives attending DSE 2019 to their annual meeting. Audiovisual and digital signage installations nominated for the best digital signage creations of the last year. Plantronics rebrands as Poly, dealing with counterfeit AV products, and the power of partnerships. Discussing Digital Signage Expo 2019 and creating consistent content for digital signage. Digital signage at ISE 2019, getting ready for DSE, and using retail analytics in your displays. The do’s and don’t of deploying digital signage in higher education, and discussing Digital Signage Expo. Previewing Digital Signage Expo and discussing the University of Illinois’ unique digital signage deployment. Preparing for Digital Signage Expo 2019 in March. Discussing the change in venue as well as the changes to the curriculum.